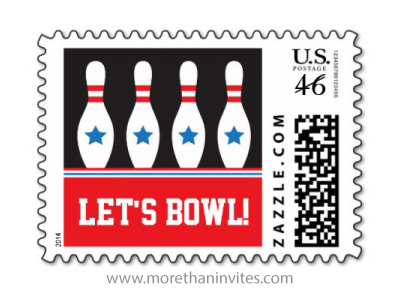 Bowling party postage stamps featuring white bowling pins with red stripes and blue stars and customizable text “Let’s bowl”. Landscape: 1.8″ x 1.3″ (image: 1.1″ x 1.1″). Choose from several postage denominations.